The book covers branding, inbound and outbound marketing, writing content, closing the sale, your computer and working with images. The marketing techniques presented are the fundamentals that all artists should make themselves familiar with. You'll be introduced to the different marketing channels, online through the various websites and social media, or offline such as getting your work out through word of mouth, galleries and different people. There's information on dealing with galleries, pricing your work and getting paid. I feel that the book lacks depth. The experiences mentioned are all based on personal experience which can be limiting. For example, in many cases Worsley would refer the resources that he personally uses, such as websites or software, but I also know that there are a host of other very good alternative resources out there. At times, I think Worsley may not understand the power of the resources. For example, he uses Facebook only to communicate with his grandchildren. I know of many artists who have Facebook pages and are doing a good job promoting their artworks and responding to fans. There's a section on computer and working with images which I felt was rather unnecessary especially the parts where there's nothing to do with marketing. There's useful information there, but just not related to marketing. I believe the section is written for those who absolutely have no knowledge of computers. 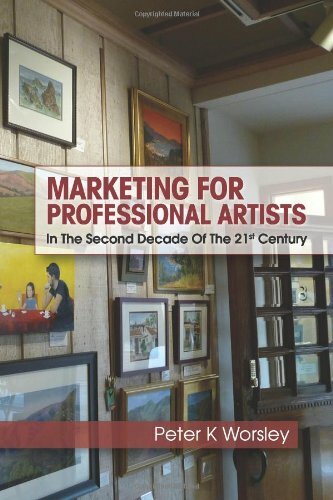 Overall, it's a decent book that introduces marketing to artists. It lacks depth, so I would recommend exploring more into the specific topics mentioned in the book. The book would have been more useful from interviews with artists who have success at marketing, both online and in the real world.